1947 FBI PHOTO PROOF OF UFO's! PROOF THE US GOVERNMENT USED UFO TECHNOLOGY FOR STEALTH BOMBER! Today I was given an url to the official FBI FOIA (Freedom Of Information Act) web site. The site claims to have 1600 pages of UFO documents released to the public. The FBI UFO web page has 11 PDF File Links. I was told to download all 11. I was shown how to put all 11 files into a single PDF file. When I did, I found out there are only 940 Pages, where are the other 660? I was told to copy page 14 of the first file. The page is really horrible, as many of the first few pages are. They are basically illegible. I was told how to copy and paste page 14 into my image-editing program. I was told how to negatize the image, the same process used on the Shroud of Turin to reveal HIDDEN IMAGES. As soon as I did, LO AND BEHOLD, two washed out images became two very clear images of REAL UFO's. 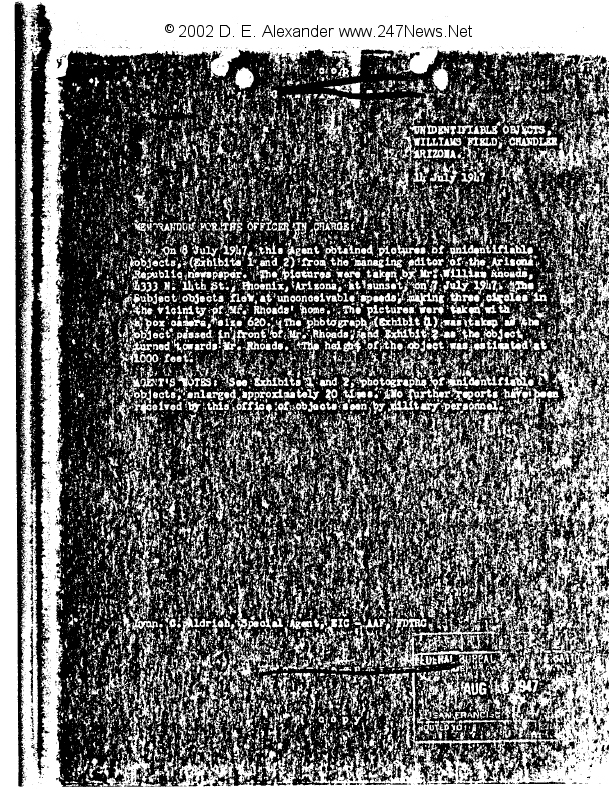 I did the same with the blacked out report page about these two FBI UFO PHOTOS that was located two pages before THE FBI UFO PHOTO EXHIBIT PAGE. 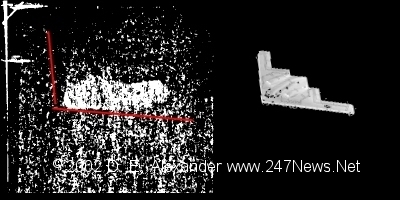 It was a DETAILED FBI SPECIAL AGENT REPORT filed by Agent Lynn C. Aldrich (EIC - AAF, FDTHC) about how the images were taken in Phoenix Arizona by a William Rhoads. The UFO photos were taken Aldrich stated on July 7th 1947. That is the EXACT day of the Roswell Crash in New Mexico! Now this is INFORMATION RIGHT FROM THE FBI's PUBLIC RELEASE OF DECLASSIFIED UFO INFO! The FBI tried to confuse the public by inserting an irrelevant page in between the OFFICIAL FBI REPORT on these images and the actual EXHIBIT PAGE! The most AMAZING thing is the first photo has the exact shape of the B-2 STEALTH BOMBER! For years we have all heard the Stealth Bomber was reversed engineered technology from the Roswell Crash! DAMN HERE IS THE PROOF! What is a photo of the modern stealth bomber doing in an FBI PHOTO FILE from July 7th 1947 THE EXACT DATE OF THE ROSWELL CRASH? How brazen was the FBI to release this info cleverly manipulated so NO ONE would suspect THIS WAS THE SMOKING GUN to the whole Roswell Crash story! Below are links to the full size page RIGHT FROM THE FBI that you too can verify haven't been altered by me in anyway. The only altering was by the FBI to try to hide THIS AMAZING INFO. Here is a full size image as the FBI wants you to view it. Here is the reverse negative HIDDEN IMAGE! Here is a photo of the present stealth bomber next to the 1947 Winged Craft! Here is the 1947 second UFO photo. 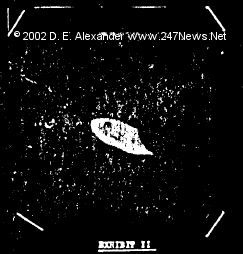 Here is the 1947 second UFO photo with the reverse negative look. Look how clear the UFO is! 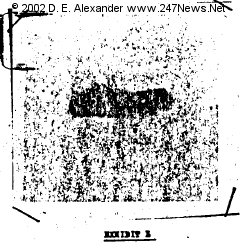 Here is a link to the Original Page 14 FBI UFO PHOTO Exhibit Page! 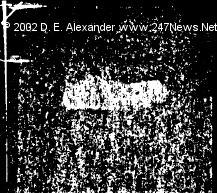 Here is a link to the HIDDEN FBI REPORT ON PAGE 12 about these two UFO Photos I downloaded right from the OFFICIAL FBI UFO FILE that I have use the Shroud of Turin technique on! All I did was negatize the black page and LOOK AT THE STORY that appears! 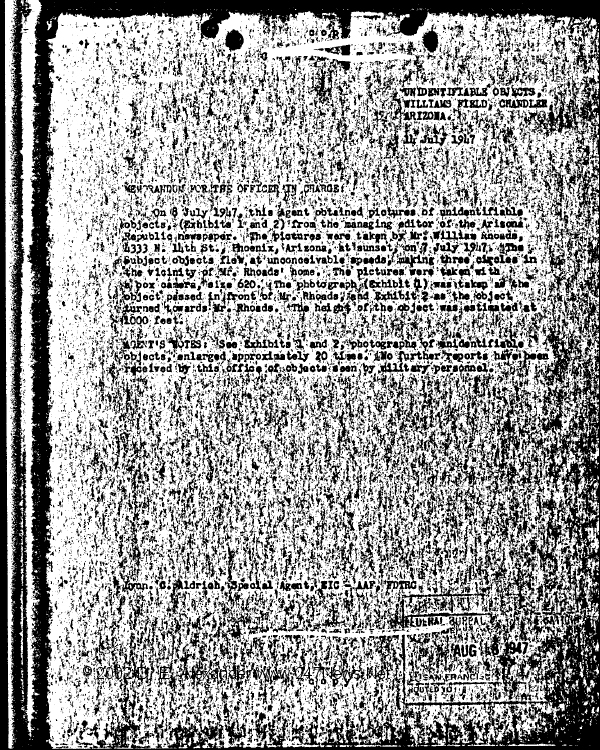 Here is a link to the ORIGINAL PAGE 12 released by the FBI that you can't read until you negative it! The FBI HIDDEN REPORT SAYS the photos above were taken July 7th 1947, THE EXACT DATE OF THE ROSWELL CRASH! The agent says he obtained the photos July 8th 1947 in Phoenix Arizona! The agent filed the report July 14th 1947! The report says the two photos are exhibits 1 and 2! 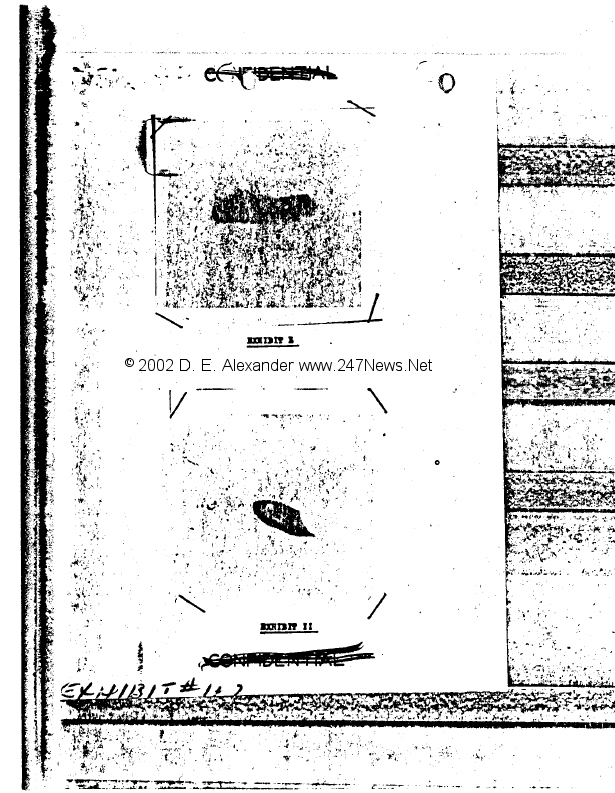 Two pages later in the OFFICIAL FBI UFO FILE, the images above appear as EXHIBITS 1 AND 2! This is not a hoax, these are THE PROOF ROSWELL OCCURRED! A Stealth type UFO PHOTO in the FBI FILE authenticated by the FBI for July 7th 1947. A clear attempt by the FBI to obscure or hide the report and photo! The person that told me where to look and how to do this was one of the most famous personalities on the Net! The FBI has one of the largest files ever assembled on anyone on HIM! He has publicly predicted quake prediction after prediction for major 7.0+ quakes. He hits dates and/or locations for major 7.0+ quakes in his warnings. The USGS has several seismologists analyzing his quake warnings. I did a whole book on his 911 warning (titled The 911 Warning), it was a warning that he issued PUBLICLY on the Net before 911 occurred! A warning so clear the FBI stopped by my publisher's office asking about how he knew of 911 before it happened. His 911 warning stated MAJOR TERRORISM NEW YORK CITY IN SEPTEMBER! A BIG BANG IN THE BIG BUILDING! The same WARNING stated the NYC media would be struck in early October after the September terrorism occurred! The same person sued the US Government in 1996, Eastern District Pennsylvania, US Federal Court, located in Philadelphia. In that case he explains the US Government detained him for faxing a warning about the Oklahoma City bombing to several major US Media executives! The warning stated April 19th 1995 BIG BANG! The warning named the building! The person who the FBI has thousands of CLASSIFIED Pages on is named Sollog! His site is Sollog.com! Look in any search engine and you'll see thousands of references to him and his warnings! His site is in the top 99.9% of all web sites on the net for traffic as per the Alexa ratings! Yet the US Media refuses to TELL THE US PUBLIC about his amazing quake and terrorism warnings! He says NUKE TERRORISM will soon hit western cities! The first act of nuke terrorism he says hits Israel, then Rome then Washington DC! Bush knows all about THE COVERUP of the Sollog 911 Warning! The media helps the government KEEP THE US POPULATION ILL FORMED! Well here is the PROOF the US government COVERED UP ROSWELL! PROOF THEY STOLE UFO TECHNOLOGY! If I were you and I lived in a major US City I would leave tonight! Don't look back, NUKES ARE NEAR! PS to Sollog fans. Yes the FBI agent filed the report July 14th 1947. 13 years to the EXACT DATE Sollog was born! That's why us Sollog fans say SOLLOG RULES! 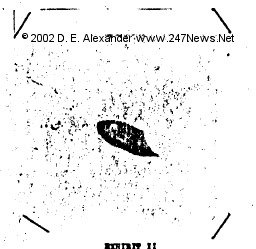 Editing Note: On 5/20/2002 I added the name of the Special Agent that filed the report about the July 7th 1947 UFO Photos and the name of the person that agent stated took the UFO photos to this article. A search of Internet web pages and usenet posts reveals THIS IS THE FIRST TIME anyone has mentioned agent Lynn Aldrich in connection with the FBI and UFO's! The initials Agent Aldrich used in the report are UNKNOWN as to his assignments. The initials EIC - AAF are for some sort of Intelligence group connect to the AAF (Army Air Force). FDTHC does not appear in any known government document. It is probably a Super Secret Defense Organization. If anyone knows what these initials Agent Aldrich used means, send them to our editor.